Say Goodbye to Disposable Plastic Products! Letâ€™s enjoy drinking iced lemon tea without straws next time! Time is money. Plastic products have become almost a â€œnecessityâ€ in our daily life for the sake of convenience. Can you figure out how many types of plastic products are used as disposable containers, packaging and shopping bags in our daily life? While we may save 15 minutes by using these products, it may take from hundreds to ten thousand years for our nature to decompose them. Is it really necessary and worthwhile? letâ€™s Take Action for Plastic Waste Reduction! 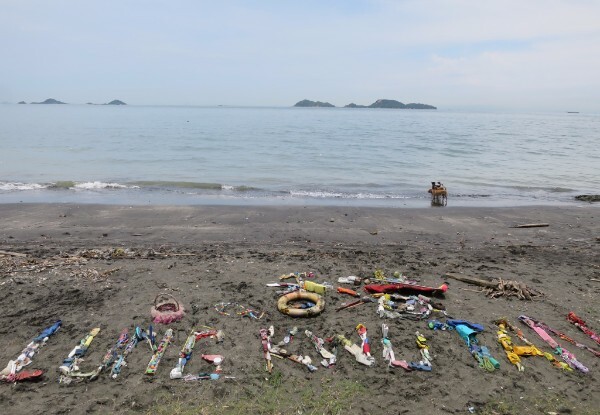 During a cross-border clean-up activity on the World Environment Day, participants in all the locations used the marine litter they collected to spell out the names of their clean-up sites, showing the extent of the marine litter problem as well as their determination to combat it. In 2012, the plastic pellet spill incident in Hong Kong south waters has provided an important lesson for us to learn and also an opportunity for OPCFHK to meet people who share the same belief in the clean-up. With the efforts of different parties, the pellet spill crisis was alleviated but the physical effects of marine debris are a constant presence on Hong Kongâ€™s beaches and coastlines. OPCFHK has been supporting Coastal Watch project in collaboration with other green groups to bring forward the momentum of the clean-up to cherish our oceans and keep them clean. We aim to use scientifically-sound methodologies to study, protect and provide year-round monitoring for all of Hong Kongâ€™s ecologically valuable coastal habitats. In two years, the Foundation focused on conducting surveys on ecology, litter and micro debris at three habitats of horseshoe crabs â€“ Pak Nai, Ha Pak Nai and Shui Hau and launching clean-ups. In addition to our submission of research findings to government departments concerned to facilitate the formulation of marine conservation policies, we explained the importance of horseshoe crabs to participants so that they could experience and understand the problem of marine debris, inspiring them to think about strategies for waste reduction at source in daily life. 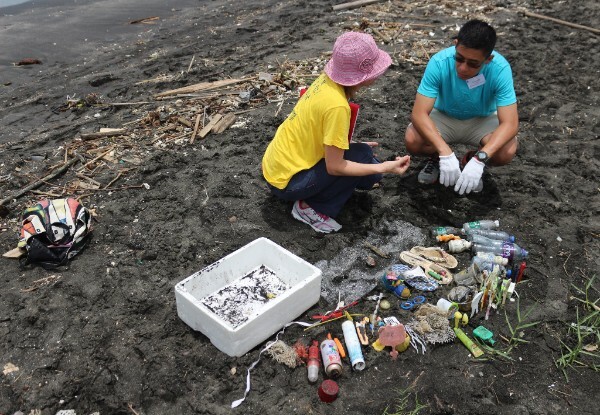 Timed to coincide with the World Environment Day on June 5, the Coastal Watch team organised the first ever cross-border clean-up activity, teaming up with passionate organisations from Hong Kong, Macau and mainland China. The opening ceremony for this regional clean-up was held at Lung Kwu Tan in Tuen Mun, one of Hong Kongâ€™s worst marine litter black spots. Quick statistics collected from 16 locations in Hong Kong showed that this clean-up collected 194 bags of marine litter, a total of 1.8 tonnes. In terms of the marine litter collected in Lung Kwu Tan, plastic items accounted for the highest proportion of all marine debris. 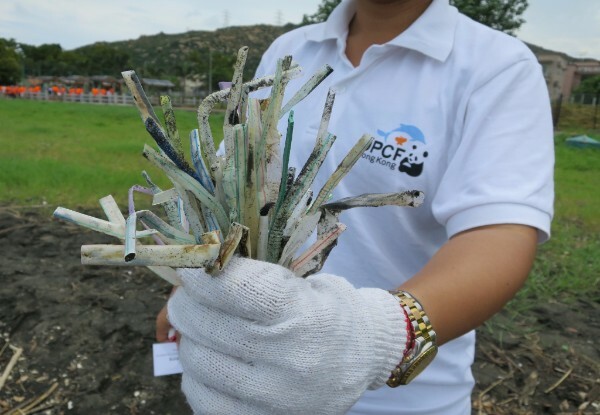 For example, there were 791 plastic caps, 594 plastic plates and cups, 303 plastic straws and stirrers found. This clearly reflects a serious regional problem with the consumption and improper disposal of single-use plastic products. While it is obviously impossible to solve the problem of marine debris solely by coastline clean-up activities, waste reduction at source, effective use of resources and recycling are more desirable strategies. Are you willing to join hands with us to protect the environment? 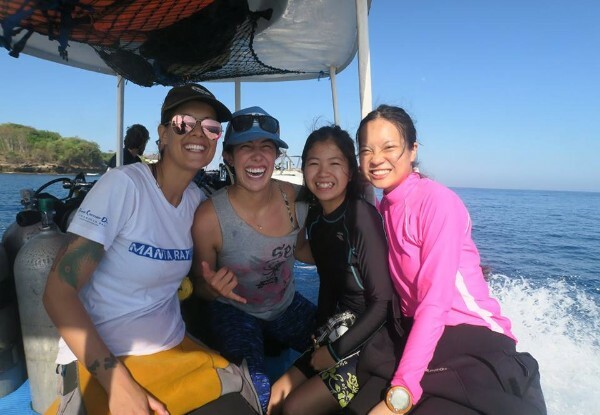 With the sponsorship from OPCFHK, Danielle and Yolanda visited Indonesia and participated in a conservation project in May on the impact of marine debris to manta ray and assisted in the identification work of different manta ray individuals from their photos. Manta ray is a filter feeder with small plankton as food. If these regions are full of micro plastics and marine debris, what impacts would the toxicity of these plastics bring to their health? This is the answer that Marine Megafauna Foundationâ€™s research team wishes to find out. Manta ray belongs to the mobulid family, with a possible disc-width of 4.5 metres. In spite of their giant body, they are filter feeders which feed on plankton by filtering sea water with their gills. Similar to whale sharks, they are popular with divers and snorkelers. This ecotourism supports the economy of various remote regions. Nevertheless, they are being captured as food and traditional medicine. Struggling under fishing gear entanglement and over-fishing, they are classified as vulnerable species on the IUCN Red List of Threatened Species and the international trading is under the control of the Convention on International Trade in Endangered Species (CITES) of Wild Fauna and Flora. Manta ray appears at coasts and the shallow water of remote islands. They also assemble at the coral area of shallow water and allow fish to eat the parasites and necrotic tissues on their bodies. 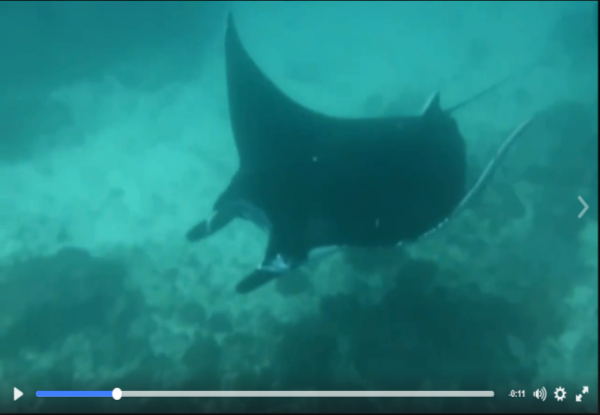 These areas, regarded as â€œcleaning stationâ€ under water, are hot spots of ecotourism where researchers take photos to identify different manta ray individuals. 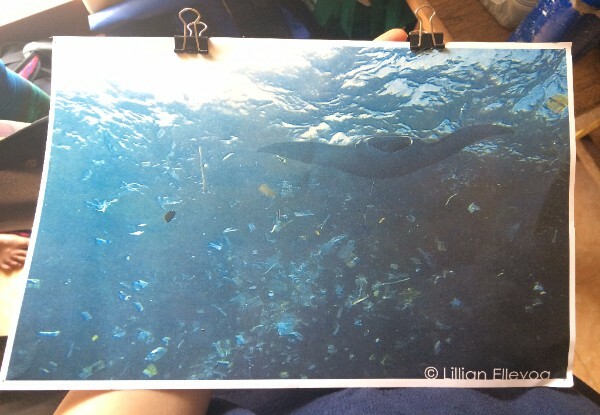 Through their participation in University Student Sponsorship Programme in Wildlife Conservation, Danielle and Yolanda traveled to the water near Bali of Indonesia and dived to the â€œcleaning stationâ€ to take photos for different individuals of manta ray following researchers and volunteers from Marine Megafauna Foundation. They identified different individuals by comparing the patterns on the ventral side of the ray. After the trip, Danielle understands the difficulties of field surveys and the research teamâ€™s strong belief. She believes conservation is not just protection for a single species, but it is a change in our mind to work together with others to make a difference. Her determination to engage in conservation becomes stronger after the trip. People could combat the problem of water pollution by filtering and distillation. But how can marine animals survive under the threat of marine debris? To further enhance the publicâ€™s understanding of horseshoe crabs, the Foundation together with Hongkong Land will present a two-week community event on horseshoe crab conservation. Families and students are encouraged to learn about the indigenous species, through a series of games, DIY workshops and conservation talks. The fun-filled weekend activities will help brush up conservation knowledge and unleash creativity. The community event will be held at The Rotunda of Exchange Square in Central between June 30 and July 14. Creative workshops on the weekends (July 1 to 3 and July 9 to 10) for both kids and adults include craft-making of horseshoe crab paper helmet, DIY T-shirt Up-cycling Tote Bag, Conservation Postcard Making, Embrace Horseshoe Crab Conservation Talks (to be delivered in Cantonese or English) as well as other conservation-themed games. Registration is required for the activities, please visit OPCFHK Facebook page for more information, seats are limited and will be reserved on a first come, first served basis. Descendants of the Earth: Horseshoe Crab marks the finale of Juvenile Horseshoe Crab Rearing Programme 2015 â€“ 2016. This year a Video Competition was introduced to the Programme. Students who participated in rearing the juvenile horseshoe crabs at schools were invited to create short videos to promote public awareness on horseshoe crab conservation, whilst developing important critical thinking and communication skills. 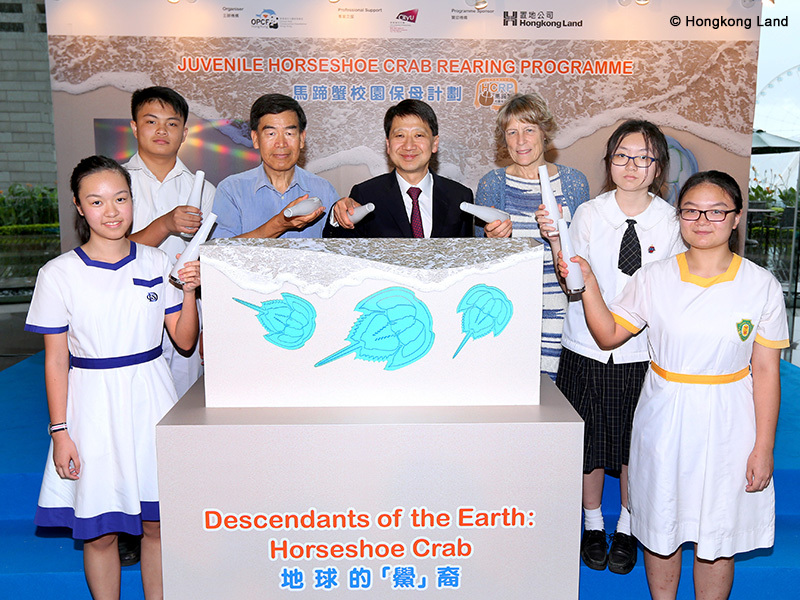 Results of this Video Competition were announced at the Finale Ceremony of Juvenile Horseshoe Crab Rearing Programme 2015 - 2016 on June 29 at The Rotunda of Exchange Square in Central. Please visit OPCFHK Facebook page to view the videos. Students will be divided into different groups to bring their horseshoes crabs to their habitat â€“ Ha Pak Nai on June 30 and July 4. They will return to the wild after mudflat clean-up. Microchip insertion will be arranged for suitable babies to study their growth and survival status. This Saturday will be the Flag Day of the Foundation in Kowloon Region. Registered volunteers please read the volunteer guide carefully and familiarise with the work flow of Flag Day and the purpose of fundraising â€“ support our efforts in the local marine mammal stranding response programme, scientific projects of local species and local community education programmes. We have 60 photos of wild animal species printed on the flag paper. While you donate to support our conservation work, you can also visit the website of the Foundation to obtain more information about species under threats in Asia. 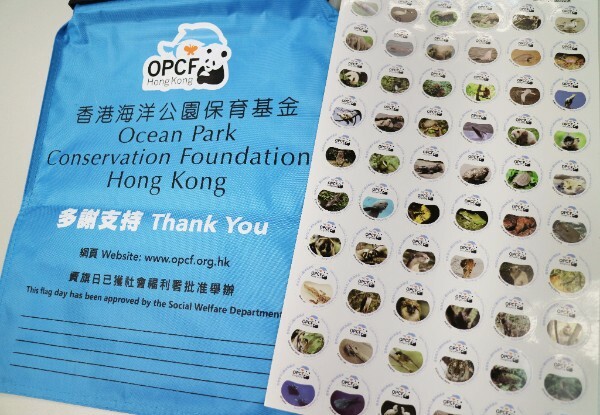 Please recognise the flag bag and flag paper of OPCFHK. See you this Saturday in Kowloon Region! Friends of the Foundation organised a â€œChinese White Dolphin Field Tripâ€ on June 26, guiding 42 participants to the west water of Hong Kong. Through the narration of tour guide, participants explored the threat faced by White Dolphins and learnt about their behaviours and measures to protect them. They were also reminded to contact AFCD at 1823 for reporting cases about stranded dolphins.